Neck Injuries; Spinal Cord Compression; Quadriplegia; Whiplash Injuries. Transient neurological deficit following cervical trauma have been reported following sports injuries, and has been referred to as cervical cord neurapraxia. The so-called “whiplash injuries” following minor motor vehicle collisions usually do not produce any neurological deficit. Here we report the case of a whiplash type of injury presenting with a delayed onset neurological deficit, which was followed by rapid and complete recovery. The patient, an otherwise healthy 34-year-old male, attended the emergency department of Sultan Qaboos University Hospital following a rear-end motor vehicle collision. We present images showing degenerative disc disease causing spinal canal narrowing and mild cord compression in the patient, but no spinal instability. Differential diagnoses are also discussed. Transient neurological deficit following cervical spine injury or cervical cord neurapraxia (CCN) has been described following sports injuries. However, the onset of symptoms is usually immediate with subsequent rapid and complete recovery.1 Radiological findings are normal except for pre-existing narrowing of the canal, which may be congenital or degenerative.1 Here we report the case of a patient presenting with acute quadriplegia a few hours after a minor “rear-ending” type of motor vehicle collision, followed by rapid recovery. An otherwise healthy 34-year-old male was referred from the local health center (LHC) to the emergency department (ED) of the Sultan Qaboos University Hospital following a motor vehicle collision where his car was “rear-ended” at low speed. He was wearing a seatbelt and a history of being involved in a previous minor collision. At the time of the collision, there was no loss of consciousness or neck pain and he was asymptomatic when he reached home. Four hours later, he started to have a headache and generalized body ache. He visited the nearest LHC where his headache worsened and he was unable to move all of his limbs. He was then escorted by ambulance to the hospital. On arrival to the ED, he was fully conscious and oriented. All of his vital signs were within normal limits. Neurological examination revealed a flaccid quadriplegia with absent deep tendon reflexes and intact sensations. Examination of the neck revealed no tenderness. He was administered a bolus dose of intravenous methylprednisolone 30mg/kg, and sent for radiological evaluation with a cervical collar. All of his laboratory investigations, including electrolytes and blood sugar, were within normal limits. Computed tomography (CT) scan of the brain was normal, and the cervical spine showed no bony injury. There was narrowing of the C5-6 disc space suggestive of degenerative changes [Figure 1]. Figure 1: Sagittal reconstruction computed tomography scan of the cervical spine showing no bony injury or subluxation but degenerative changes in the C5-6 discs, including disc space narrowing and posterior osteophytes. Following the scan, he had a rapid neurological improvement. When seen by the neurosurgeon, he had normal power in all of his limbs. 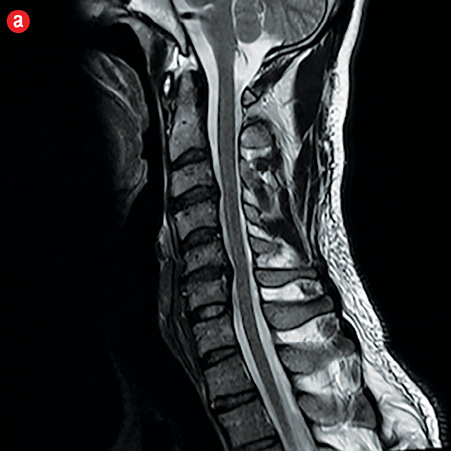 Magnetic resonance imaging (MRI) of the cervical spine showed C5-6 disc degeneration and herniation causing thecal and mild cord compression [Figure 2]. He underwent an anterior C5-6 discectomy with fusion and anterior fixation. He was discharged on the fifth day with normal power and sensations in all of his limbs. The patient had no neurological deficits when he was seen on a follow-up visit after six weeks.However, he continued to have mild headaches, which resolved within two weeks. Figure 1: Sagittal (a) and axial (b) T2-weighted magnetic resonance imaging revealed hyperintense cystic lesion with hypointense rim in the liver. “Rear-ending” type of motor vehicle collisions typically result in what is commonly referred to as whiplash injuries with mainly minor musculoskeletal problems including, neck pain, headache, dizziness, neck movement restriction, and rarely paresthesia and focal weakness due to brachial and peripheranerve entrapment.2-4 Significant neurological deficits suchas quadriplegia are uncommon with this type of trauma. The other main concern for a patient presenting with headache and quadriplegia is to rule out any vascular injury, such as vertebral or carotid artery dissection. Major cervicocephalic arterial dissections may present with only headaches and neck pain,6 or with major symptoms of cerebral ischemia such as hemiplegia, visual loss, and cranial nerve palsies.7 In this case, the MRI images did not reveal any evidence of carotid or vertebral artery dissection. Another cause for a subacute or delayed neurological presentation is the anterior spinal artery syndrome.8,9 There is usually both sensory and motor involvement. However, there is a reported case of spinal cord ischemia following anterior spinal artery occlusion with sensory sparing.10 Recovery with this kind of arterial injury is not as rapid or complete and MRI always shows evidence of cord ischemia, which was absent in this case. However, a reversible arterial spasm could possibly explain the transient deficit with minimal cord changes on MRI. In this patient, the clinical features are compatible with that of CCN in terms of rapid onset, and transient nature with rapid and complete recovery. The pathophysiology of this kind of injury is due to the sudden stretching of the cord in a hyperflexion/hyperextension injury compounded by a narrow cervical canal due to pre-existing degenerative disc disease.1 However, the delayed onset cannot be explained in this manner. A transient vascular insult like vasospasm can probably account for the slightly delayed onset and also the rapid recovery. The role of steroids in the recovery process of this patient is highly debatable as the recovery was too rapid to account for the steroid effect. 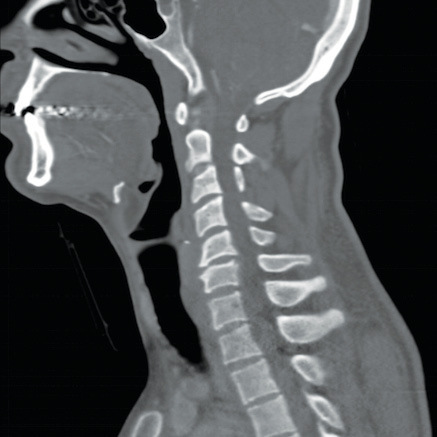 Minor whiplash injuries to the cervical spine can result in neurological deficits in the presence of cervical canal narrowing. In an acute presentation, bony injury and instability remain the primary pathologies to exclude followed by vascular injury using appropriate imaging modalities. Neurapraxia would remain a retrospective diagnosis. Torg JS, Corcoran TA, Thibault LE, Pavlov H, Sennett BJ, Naranja RJ Jr, et al. Cervical cord neurapraxia: classification, pathomechanics, morbidity, and management guidelines. J Neurosurg 1997 Dec;87(6):843-850. Evans RW. Some observations on whiplash injuries. Neurol Clin 1992 Nov;10(4):975-997. Obelieniene D, Schrader H, Bovim G, Miseviciene I, Sand T. Pain after whiplash: a prospective controlled inception cohort study. J Neurol Neurosurg Psychiatry 1999 Mar;66(3):279-283. Pearce JM. Whiplash injury: a reappraisal. J Neurol Neurosurg Psychiatry 1989 Dec;52(12):1329-1331. Aebli N, Wicki AG, Rüegg TB, Petrou N, Eisenlohr H, Krebs J. The Torg-Pavlov ratio for the prediction of acute spinal cord injury after a minor trauma to the cervical spine. Spine J 2013 Jun;13(6):605-612. Maruyama H, Nagoya H, Kato Y, Deguchi I, Fukuoka T, Ohe Y, et al. Spontaneous cervicocephalic arterial dissection with headache and neck pain as the only symptom. J Headache Pain 2012 Apr;13(3):247-253. Thanvi B, Munshi SK, Dawson SL, Robinson TG. Carotid and vertebral artery dissection syndromes. Postgrad Med J 2005 Jun;81(956):383-388. Gupta B, Agrawal P, D’souza N, Soni KD, Kumar A. Delayed presentation of spinal cord trauma. J Neurosci Rural Pract 2011 Jan;2(1):114-116. Schmidt BJ. 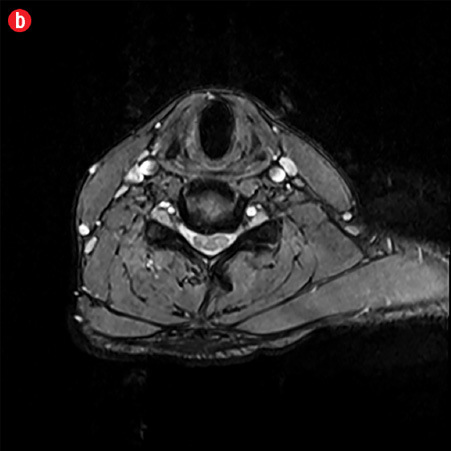 Subacute delayed ascending myelopathy after low spine injury: case report and evidence of a vascular mechanism. Spinal Cord 2006 May;44(5):322-325. Abdel-Mannan O, Mahmud I. A patient presenting with intact sensory modalities in acute spinal cord ischemia syndrome: a case report. J Med Case Rep 2011;5:31. Latronico N, Rasulo FA, Recupero D, Beindorf A, Liberini P, Stefini R, et al. Acute quadriplegia with delayed onset and rapid recovery. Case report. J Neurosurg 1998 Apr;88(4):769-772. Bydon M, Lin J, Macki M, Gokaslan ZL, Bydon A. The Current Role of Steroids in Acute Spinal Cord Injury. World Neurosurg 2013; pii S1878-8750.